"Scientists look for data anywhere they can find it. 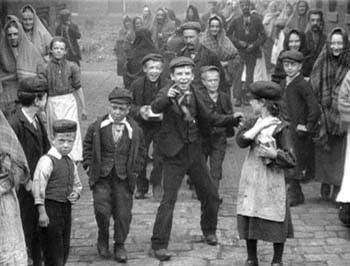 Researchers from University College London studying handedness, for example, found data in a group of early 20th-century films of everyday English life. "More than 800 short films made from 1900 to 1906 by Mitchell & Kenyon, a company in Blackburn, were found in 1994 and preserved by the British Film Institute. The researchers, Chris McManus and Alex Hartigan, wanted to see what the films showed about rates of left-handedness. More than 10 percent of people are left-handed, but studies have shown that the percentage was lower a century ago. "The researchers found 391 arm-waving examples in the films, 61 involving the left arm. Other studies have shown a correlation between arm waving and handedness. "In a control sample of 391 modern images of arm waving, 95 involved the left arm. The findings were published in Current Biology. "The researchers estimated the ages of arm wavers and found that the frequency of left-arm use increased with age. It was higher, for example, among people estimated to have been born in the 1860s than those born in the 1870s. "The researchers concluded left-handedness declined in Victorian England because of social and school pressures and the rise of industrial tools, among other factors, reaching bottom around the turn of the 20th century."